How Much Does Handyman Work Cost? The picture shows a small amount of dry rot at the base of a trim board. Can the board be repaired with a bit of wood filler or should it be replaced? 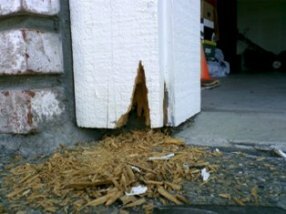 A pest repair professional might quote as much as $175 for this repair. But is that a reasonable price? What would a handyman charge to do the same work? How do handyman rates vary from one area to another? How much should you pay for handyman work? What would be a reasonable price? As a consumer, how do you know if you’re being ripped off? Could you be paying too little? Is the price you’re being quoted a reasonable one? Are you a homeowner with work to be done? You are invited to submit your request for a handyman estimate. You may also want to browse the Handyman Job Estimates page and are welcome to give feedback. Are you a professional handyman? How much would these jobs cost in your area? Please leave feedback on the estimates given. How much would these jobs cost in your area? Do you agree with the pricing? Do you have suggestions about how the work should be done? Want to advertise your Handyman Business? List your business in our Handyman Directory and leave comments on the job pricing on this site to generate new business. Notes: Handyman jobs are shown in the Handyman Pricing Blog. Many have actual prices charged for the work performed while others show estimates of what might be considered to be a reasonable estimate. All handyman estimates are intended to be used for comparative purposes only.